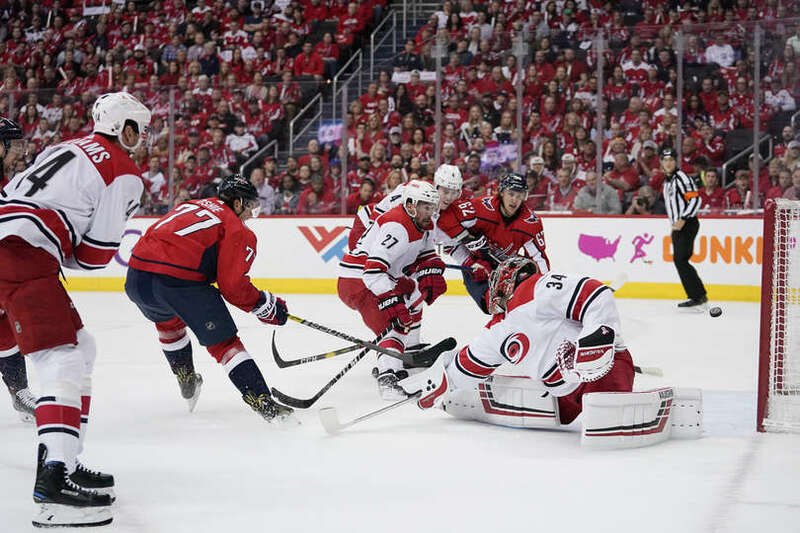 The Washington Capitals beat the Carolina Hurricanes 4-3 (OT) Saturday afternoon at Capital One Arena in the District. Brooks Orpik would pot the game-winner 1:48 into the extra frame. The win gives the Capitals a 2-0 series lead, as the series now shifts to Raleigh, North Carolina for Games 3 and 4. Game 3 of the series is set for Monday night at PNC Arena in Raleigh, North Carolina. Puck drop is set for a little after 7:00 PM. The Capitals notched the games first goal with a tally from Nicklas Backstrom at 3:37 of the first period. Alex Ovechkin (1) and Dmitry Orlov (1) were credited with the helpers. The Capitals would make it 2-0 with a goal from T.J. Oshie at 9:26 of the first frame. Oshie would kick the stick out of Justin Williams hands, clearing a path to the goal mouth. Evgeny Kuznetsov (2) and Matt Niskanen (1) had the assists. The Canes would answer before the end of the first frame with a goal from Lucas Wallmark at 15:54 of the first frame. The Capitals would challenge for goaltender interference, but after the review, the goal stood. The first period concluded with the Capitals leading 2-1. The Hurricanes led in shot attempts 16-11 for the first period. The Capitals were out-attempted 10-1 after their second goal. Carolina led 12-7 in shots on goal. The Capitals were 0 for 1 and the Hurricanes 0 for 2 on the power play in the first frame. After a mostly penalty-riddled middle frame, the Hurricanes would tie the game late in the period with a goal from Sebastian Aho at 16:45 of the second period. The middle frame would end with the game knotted at 2-2. Washington led in shots on goal 16-6 for the middle frame. Both teams were 0 for 4 on the power play after two periods. The Capitals would regain the lead with a goal from Tom Wilson at 8:55 of the final frame. Alex Ovechkin (2) and Nicklas Backstrom (1) had the assists. The Hurricanes would tie the game with a power play goal from Jordan Staal with 5 minutes left in regulation. Regulation would end with the game tied 3-3. Carolina led in shots on goal 10-9 for the final frame. The Capitals led 32-28 for regulation. The Capitals would win it in overtime with a goal from Brooks Orpik 1:48 into the extra frame. Orpik would lean into a feed from Evgeny Kuznetsov and turn out the lights for game 2. Brooks Orpik’s overtime winner marked his second playoff overtime goal of his career. He’s one of 11 defensemen in NHL history with at least two overtime goals, and one of three active defensemen. Nicklas Backstrom of scored in the first period to record his 101st career point in the Playoffs. He passed Daniel Alfredsson for sole possession of fourth place on the NHL’s all-time list among Swedish players. The NHL box score for the game is here. This entry was posted in Game Re-Caps, News and tagged 2019 NHL Stanley Cup Playoffs, Carolina Hurricanes, Jon Sorensen, Nicklas Backstrom, T.J. Oshie, Tom Wilson, Washington Capitals. Bookmark the permalink.